GNC unfair competition with its franchisees has been the subject of much litigation and anger in the past. A review of the company’s franchise disclosure documents reveals that GNC reserves the right to compete with its franchisees and to empower others to directly compete with GNC franchisees in their ironically named “protected territory.” How big of a problem is this competition causing for GNC franchise owners? (UnhappyFranchisee.com) GNC claims to offer a “protected territory” to its franchisees. Just how protected is the GNC territory? Are you a GNC franchise owner or area developer? Do you feel the franchisor unfairly competes with you and other franchisees? Share a comment below or email us in confidence at UnhappyFranchisee[at]gmail.com. 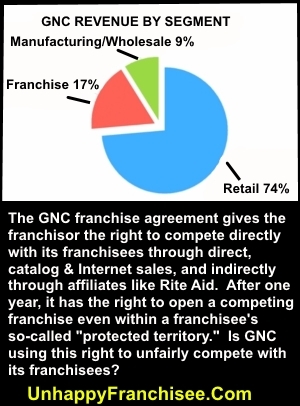 Question for GNC: With a franchise fee of up to $40,000 and an investment as high as $806,000, why does GNC grant its franchisees a protected territory for only a single year? Imagine that you opened a GNC retail store, then, 12 months later, were notified that the company has identified a site directly across the street for another GNC store. Imagine that the company notified you that if you didn’t agree to open that franchise – which would obviously cannibalize your 1 year-old store’s sales – that they’ll sell it to another franchisee. Sound hard to believe? It appears that the GNC has reserved that right. …if, after expiration of the protective period set forth in the table above, we identify within your Protected Territory a site for a new GNC Store, we will give you notice of that opportunity, and you will have a right to franchise that location (the “right of first refusal”), if you execute and return a then current form of our Franchise Agreement and Disclosure Document receipt, pay the initial franchise fee within 30 days of receipt of our notice, and open the Store within the Pre-Opening Period of your Franchise Agreement. If you do not respond within the 30-day notice period, waive your right to open the Store prior to expiration of the 30-day period, or do not open the Store within the Pre-Opening Period, we will have the right to franchise the site, and your right of first refusal will expire. Question for GNC: Does the franchisor have the right to open another franchise within the Protected Territory – even right across the street – after one year? As a GNC franchisee, you are granted the right to make retail sales only to customers who are physically present in your Approved Location. The GNC parent company has the right to target the established customers and potential customers in your “Protected Territory” through any other means possible. They have the right to offer the same exact products that you sell to your established customers at a lower price and with the convenience of home delivery. As the manufacturer, GNC can potentially undercut your prices, rid themselves of unwanted inventory while the inventory on your shelves reaches their expiration dates. We… may sell products, including GNC Brand Supplements, within your Protected Territory or Development Area through any method of distribution other than a dedicated retail GNC Store. We… may conduct a telemarketing, Internet or any other electronic media, mail order, direct mail, catalog, wholesale, distribution, direct sales, export or similar business, which may sell, among other things, goods and services under any proprietary marks, including GNC Brand Supplements… We are not required to pay you any compensation for soliciting or accepting orders from inside your Protected Territory or Development Area. We and/or our affiliates own and operate the Internet sites gnc.com and LuckyVitamin.com. Additionally, we and/or our affiliates have invested with Rite Aid Corporation in the Internet site drugstore.com. These Internet sites will enable customers to purchase vitamin and mineral supplements, sports nutrition products, diet and energy products, herbal supplements, health and beauty products, health care products, and related products currently available in retail GNC Stores, including GNC Brand Supplements, as well as provide free on-line information about health and nutrition. The products offered on these Internet sites may be the same or similar to those sold by you. We are not required to pay you any compensation for revenues derived from these Internet sites. Question for GNC: Is it fair for a franchisee to build the GNC brand and maintain a brick-and-mortar product showcase in their local market, and then receive no compensation when the franchisor entices them with online offers and home delivery? Contractually, GNC has the right to market & sell indirectly to its franchisees’ customers through Rite Aid and other brick and mortar affiliates. … [GNC] may sell and distribute to other unaffiliated retailers, such as drug stores, mass merchandisers and supermarkets, goods and services under any proprietary marks, including GNC Brand Supplements. These businesses may make sales to customers in your Protected Territory or Development Area, and they may be located in your Protected Territory or Development Area. We are not required to pay you any compensation for soliciting or accepting orders from inside your Protected Territory or Development Area. We and Rite Aid Corporation have offered GNC brand products and services via “stores within stores” since January, 1999. These GNC/Rite Aid stores are owned and operated by Rite Aid, are located inside of existing Rite Aid stores, and are staffed by Rite Aid employees… As of December 31, 2015, there were 2,327 GNC/Rite Aid stores in the United States. In addition, these products will be sold at Rite Aid stores that may be located within your Protected Territory. Beginning in January, 1999, we also became the exclusive manufacturer of Rite Aid’s private label vitamins and nutritional supplements, which may be similar to the products offered by you. Question for GNC: If the franchisor has the right to market and sell directly to a franchisee’s customer through telemarketing, catalogs and the Internet, and has the right to market and sell indirectly to a franchisee’s customers through affiliate programs with major retailers like Rite Aid, and has the right to open another franchise store across the street or the same mall as that franchisee’s store, isn’t the term “GNC Protected Territory” an oxymoron? 83% of GNC’s revenue comes from manufacturing or non-franchise retail sales. Only 17% of GNC’s revenue comes via franchise sales. As a public company, GNC has an obligation to maximize revenue and value for its stockholders the best way it can. It appears that GNC has positioned itself to maximize revenue by reserving the right to compete with its own franchisees in a number of ways, including opening more franchises in close proximity to one another, competing directly through brick and mortar affiliates, and by competing both directly and indirectly through the Internet. It seems that the GNC has structured its agreement to capture sales in a given market by any and every means possible. Unfortunately, it seems likely that future sales growth for GNC will be realized by diverting sales from their own franchise owners. Question for GNC: Where does franchisee profitability rank on the corporate priority list, as compared to company store revenue, affiliate sales, Internet sales, and stock performance? Disclaimer: This post was neither written nor reviewed by a franchise attorney prior to publication. It is an educated layman’s attempt to understand the massive GNC franchise disclosure documents, franchise agreement, and related documents in order to raise pertinent questions. We may have gotten some things wrong in our interpretation and will invite GNC management to provide clarifications, corrections or rebuttals. It is not offered as legal advice, and all prospective franchisees should hire an experienced franchisee attorney and heed their guidance. ARE YOU A GNC FRANCHISE OWNER OR FRANCHISEE? EMPLOYEE OR STOCKHOLDER?